Yoni Heisler of TUAW has compiled a list of all the Apple references ever made in The Simpsons and Futurama. Both of the long-running television shows have a combined 33 seasons between them, featuring Apple products in various episodes more than 40 times. In 2008 The Simpsons featured an all-Apple episode showcasing Apple Stores, iPods, iPhones, Steve Jobs, and the iconic 1984 Macintosh commercial. 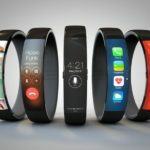 This episode introduced us to the world of all things Mapple and may very well be the most widely known Apple reference to ever appear on either The Simpsons or Futurama. The action begins when the Simpson family is at a mall and Lisa gets excited upon noticing a Mapple Store, a dead ringer in both name and appearance to an Apple Store. You’re all losers. You think you’re cool because you buy a $500 phone with a picture of a fruit on it. But guess what, they cost $8 bucks to make and I pee on every one. I have made a fortune off you chumps and I’ve invested it all in Microsoft. Now my boyfriend Bill Gates and I kiss each other on pile of your money. In 2010 during an episode of Futurama, Bender declares the Mac to be better than the PC. 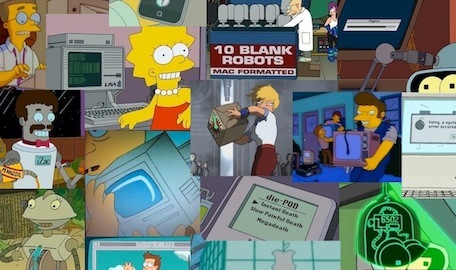 The full list of Apple references made in The Simpsons and Futurama, which includes photos and videos, can be accessed on TUAW and is well worth checking out.